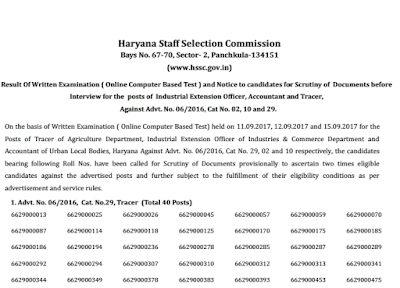 HSSC Result 2017 for Post Against Advt. No. 06/2016, Cat No. 02, 10 and 29. HSSC has declared written exam result for the posts of Industrial Extension Officer, Accountant and Tracer. 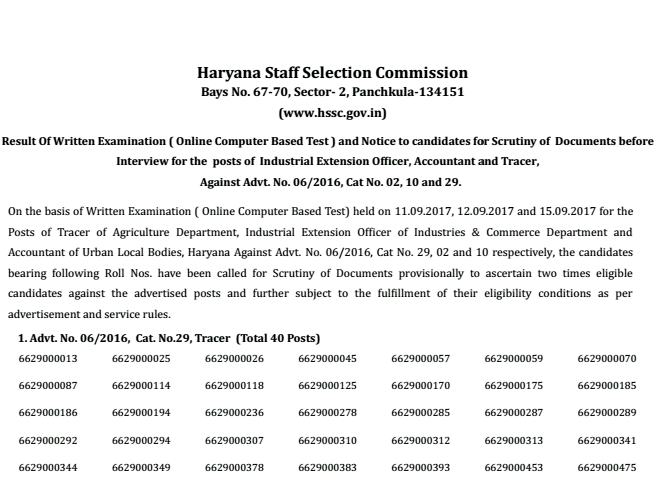 Accountant of Urban Local Bodies, Haryana Against Advt. No. 06/2016, Cat No. 29, 02 and 10 respectively. Note:- The Scrutiny of Documents of the candidates for the post of Tracer and Industrial Extension Officer will be held on 09.10.2017 and for Accountant will be held on 10.10.2017.